With their fields of lavender, olive groves, rolling hills, thick cork-oak and pine forests, vineyards, mountains and dazzling blue sea, Provence is an embarrassment of scenic riches. The region is blessed with almost year-round sunshine and a divine light, making travelling to Provence a delight whatever the season. 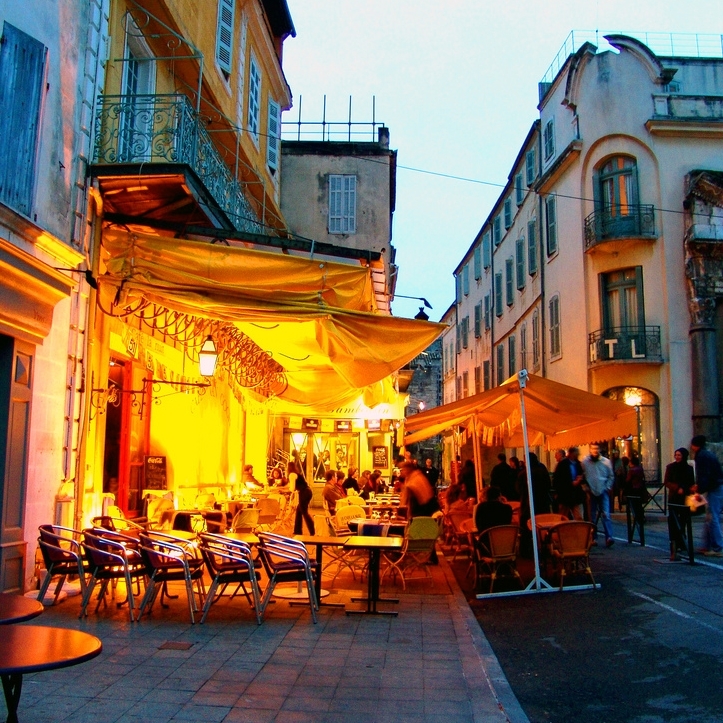 A pocket of left-bank Parisian chic deep in Provence, Aix (pronounced like the letter X) is all class: its leafy boulevards and public squares are lined with 17th- and 18th-century mansions, punctuated by gurgling moss-covered fountains. Haughty stone lions guard its grandest avenue, cafe-laced cours Mirabeau, where fashionable Aixois pose on polished pavement terraces sipping espresso. The city became a centre of culture under arts patron King René (1409–80): painter Paul Cézanne and novelist Émile Zola are its most famous sons. You will enjoy very much the open market (Tues. Thurs. Saturday) and a visit on the footsteps of the artist and a must see, the Cezanne workshop. Cézanne was born in Aix-en-Provence on Jan.19, 1839. He lived there until 1861 when he joined his friend Emile Zola in Paris to practice his art. By 1880, he returned to Aix en Provence, set up a studio and stayed until his death in 1906. During this time, he painted some of his most famous canvasses. It can be said that Cézanne formed the bridge between late 19th century Impressionism and the early 20th century’s new endeavor, Cubism. Aix en Provence has marked out a wonderful walking tour called “In the footsteps of Cézanne” that will take you through the places in Aix that are associated with the artist’s life and work. In the atelier you will find a long shelf is hung on the western wall… A table, a drawer, a short ladder, a high easel, a potbellied store, a sofa, a few chairs, the items that posed for his "still life", are basically the only furniture present in the closed world of Cézanne. A few locally decorated vases, a ginger jar and an olive pot, a fruit bowl, a plate, a glass, a bottle of rum, three skulls, a little "plaster cupid" by Francois Dusquenoy are still today the famous models of the painter. One of the best regional museums in France, the Musee Granet has been recently renovated. It has a Paul Cézanne room that holds nine paintings depicting Aix en Provence as well as paintings from the artists who visited him in his Atelier des Lauves studio. The village of Ansouis is sheltered from the Mistral wind, and overlooks the plains around the Durance river. Ansouis is ranked as one of the "Most Beautiful Villages in France", and lies in the Luberon. The village is crowned by its château and its lovely French gardens. The castle is among the most beautiful in the Luberon. Built as a fortress in the 10th century, it underwent many changes, in the 12 and 13th centuries, when it was turned into a château, then again in the 15th and 19th centuries. During the Middle Ages, Ansouis was an ideal location from which to survey the road between Aix en Provence and Apt. Today, Ansouis has retained its original beauty. Prior to reaching the château, you cross the large square and wind through the narrow streets lined with beautiful old homes. Château Val Joanis, has earned the title of château because of the splendid wines it produces. Originally the 980-acre estate of a 16th century nobleman, it is now one of the largest vineyards in the area, with a remarkable garden on the grounds that was voted “French Garden of the Year” in 2008. This morning you will head south to visit one of the most charming little fishing town on the Mediterranean coast, Cassis and explore by boat the famous Calanques. One of the highlights of the coast of southern France, the calanques are a series of limestone cliffs, fjords and rocky promontories plunging into the Mediterranean, for about 20 km of coastline immediately to the south-east of Marseille. In places there are pine trees clinging to the gleaming rock. There are several small beaches set among the rocks, with pine trees climbing the hill behind the beach, for example at En Vau and Port Pin, where you can swim between the cliffs - very dramatic! The little boat travels around the beautiful coastline with a new surprise around each corner. If you have time, a short visit to Marseille is recommended. The Vieux Port district is a real treat. And drive up to Notre-dame de la Garde (la bonne mere) from where the view is breathtaking. Today you will continue your discover and head in a different direction, to Avignon. Avignon, for some time capital of Christendom in the Middle Ages, retains the indelible mark of its grandiose destiny : the palais des papes (Papal Palace), the Saint-Benezet brigde, called the « pont d’Avignon » of worldwide fame through its commemoration by the song, and the ramparts constitute an exceptional complex of monuments listed by UNESCO as World Heritage sites. In addition dozens of churches and chapels, all remains of a past rich in history give the city its unique atmosphere. As time allows, you will also discover a few miles away from Avignon the Pont du Gard, an aqueduct that impressively bridges the River Gard. Still intact, three tiers of stone arches tower more than 36 meters across the valley. Built by Roman engineers about 20 B.C. as part of a 50-kilometer-long system bringing water from Uzès to Nîmes, the aqueduct remains one of the world’s marvels. Park in the car park amid the tourist stalls and food stands and walk a pedestrian road to the span of river that thankfully lies uncluttered, dominated only by the impact and shadow of the towering structure. Today, you will enjoy another great day in the heart of Provence, This time you will discover the famous Luberon area home of dozens of very charming villages such as Gordes, labeled as one of the most "Beautiful Villages of France", the ochre village of Roussillon, Menerbe, etc. You will also enjoy a visit to the Senanque abbey and the wonderful lavender fields (in season). We also suggest a fin and interesting visit to the cork museum. Today you will discover a beautiful area of Provence but often unknown: Les Dentelles de Montmirail. And this a few miles away from your hotel. You will complete a loop starting in St Hippolyte le Graveyron and then on to Malaucene, Vaison la romaine, Seguret (my favorite), Gigondas, Vacqueyras, and Beaume-de venise. A great day in the country side. Great landscapes, charming villages, castle and wine tasting (Gigondas, Vasqueyras) are one of the most reputable wines in France. Arles is a favorite tourist destination in Provence, made famous in recent times by painters Van Gogh and Gaugin, but has been a center since Roman times, as evidenced by the wonderful Arena in the center of Arles, still used for bullfights. The area around Arles is famous for its natural beauty, especially in the Camargue. Veritable masterpiece of Provençal Romanesque art, the Saint Paul monastery, built in the neighborhood of the Gallo-Roman site of Glanum owes its name Mausolé to the proximity of the mausoleum of the "Julii"; it rises up out of the landscape thanks to its beautiful two-storey square steeple topped by a pyramidal roof. The covered walk goes around a finely maintained garden giving the stones all their grandeur. Saint Paul de Mausole remains today a psychiatric health institution. From the top of the stairs you can see the wheat field that Vincent Van Gogh contemplated and painted during his year of confinement in the men's pavilion. Upstairs, a room recounts the history of the Saint Paul Mental Hospital. Continuing to the right, you will find a reproduction of the room where Van Gogh was confined. Across from it, another room explains psychiatry in the 19th century. Our wine expert will be very happy to arrange some fun and very interesting wine tasting. She has already had a beautiful career as a sommelier working in France and abroad at starred Michelin guide restaurants. Provence produces wonderful wines including a lot of rosés wines: Les Coteaux d'Aix en Provence, Les Cotes de Provence and a little bit further les Coteaux Varois. Rosé has been the focus of Provence winemaking for centuries. Ever since the Greeks brought wine to the area in 600 BC, the people of Provence have been perfecting the art of dry rosé production. Provence, the site of France's oldest vineyards, is the world's largest wine region specializing in rosé. The region has a rich rosé tradition, and winemakers today are the beneficiaries of the region's collective knowledge and time-honored techniques. Since rosé is a delicate wine and one of the most difficult to produce with success, these long-established traditions remain entirely relevant. The rosés of Provence are distinctly different because of the unique character of the place where they originate – the soil, climate, and terrain of the vineyards. The physical environment of Provence – with its plentiful sunshine; its mistral winds; its Mediterranean Basin soils; and its hillsides covered with wild lavender, rosemary, and thyme – is reflected in the refreshing flavors and zesty aromas of the rosé wines made there. We also like to combine wine tasting and Olive oil tasting. Provencal Olive oils are excellent. Today you will enjoy some wine tasting and Olive tasting at the best properties. First, you will enjoy a presentation of the vineyard of Les Baux de Provence by exploring the vineyards. Then, Celine will take you to one of the best properties for a visit of the cellar and enjoy some wine tasting. You will enjoy lunch at Les Baux de Provence. Right after lunch, you will enjoy the visit of a typical Olive mill. Presentation and history of the mill. And at the end you will have the opportunity to taste some of the best Olive Oils. Châteauneuf-du-Pape is a medieval village on the side of a hill, guarded by the ruins of an ancient chateau towering above. The village looks over the plain of Comtat and the 3 000 hectares of vine fields. The village is almost completely dedicated to its world famous wine "Chateauneuf du Pape" which is also part of the similarly which is also part of the similarly famous Cotes du Rhone. in the XIVe century Pope Jean XXII, chose Chateauneuf as the location for their summer residences, and then decided to plant vines on the stony land which surrounded their landholdings. For a long time the wine production remained a secret but started to become well known in the XVIIIe century but it was in 1929, that it was officially recognized and bestowed with it's own appellation Châteauneuf-du-Pape. This appellation means that the wine production in Chateauneuf du Pape is subject to strict controls to ensure that the 55 vineyards produce an extremely fine wine. Our wine expert will be happy to arrange wine tasting at some of the most reputable properties for you.